Today, June 11, the Church celebrates the memory of St. Eskil of Tuna, the Apostle of Södermanland. Eskil was one of the many missionaries who came to Sweden and Scandinavia from England in the mid 1000’s. He was a monk and was ordained a bishop in order to establish churches with full hierarchical authority – we must bear in mind that this was long before the age of trains and aircrafts, and it was not as easy to “fly in” a bishop when the need arose. It was quite common for missionaries to be ordained bishops in order to fulfill their sacred mission. We have very few sources regarding St. Eskil’s life, but the bishop Brynolf Alogotsson († 1317) had a life written. In this narrative we learn that Bishop Eskil were of English ancestry, and that he mainly worked in Södermanland, Sweden, under Inge the Elder’s reign. King Inge was baptized a Christian through St. Eskil’s mission, but was driven out by his pagan subjects when he refused maintain riksblotet (the pagan sacrifices of the land) at the council in Old Uppsala. Instead, the Swedes made Blot-Sven their new king. The epithet Blot (“blood sacrifice”) was given to the king precisely because he agreed to uphold the old pagan sacrificial traditions. When Blot-Sven organized a major pagan sacrifice in Strängnäs to honor the Aesir gods, St. Eskil traveled there to preach repentance to the assembled pagans. While the saint preached the pagans were enraged and stoned him. Thus St. Eskil became a martyr for his Lord and God and Savior Jesus Christ. The body of the holy martyr was buried in Tuna (today’s Eskilstuna) by his friends. The local tradition says that during the journey back to Tuna, his body was at one point placed on the ground and a spring miraculously gushed from that spot, and started to flow out of the mountain side just outside Strängnäs. The spring is there to this day, and is known as the Spring of Saint Eskil. King Inge eventually returned, and dethroned Blot-Sven. Through these events, Christianity gained a permanent foothold in the region. 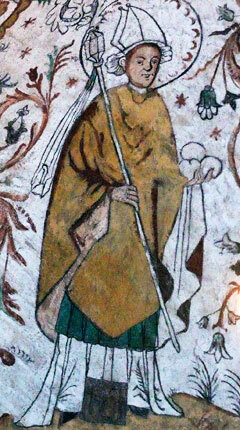 St. Eskil’s repose was celebrated on June 11. Since this day was dedicated to the Apostles Barnabas and Bartholomew, the commemoration of Hieromartyr Eskil was moved to June 12, by the Roman Catholic Church following the Great Schism. June 12 is therefore still remembered as “Eskilsdagen” (Eskil’s Day) in Sweden. The translation of his relics in Eskilstuna is remembered on October 6th.